Not sure what to do with that wonderful leftover holiday ham? Try this recipe. It’s been a family favorite for many years. Go easy on the salt and watch the beans very carefully so they don’t turn to mush. If you’re not sure how many guests you will be serving, or are planning leftovers, *reserve the spinach and add it to each bowl as needed. This will ensure freshness and a vibrant, colorful presentation. Enjoy! Preheat a 5-quart soup pot or cast-iron Dutch oven over medium-low heat. Add the diced onion, celery, garlic, olive oil and butter. Sauté carefully for about ten minutes until the vegetables have softened. Do not allow them to scorch. Add the flour. Stir constantly for another five minutes. Add the chicken broth and bring to a low simmer, stirring occasionally. Next, add the diced ham and dry spices. Stir and simmer partially covered over low heat for about 20-30 minutes. Add the pasta and beans and cook the pasta until just al dente, about 11-12 minutes. Shut off the heat and *add the spinach before serving. This hearty Polish/Ukrainian soup is sooooo damn good. 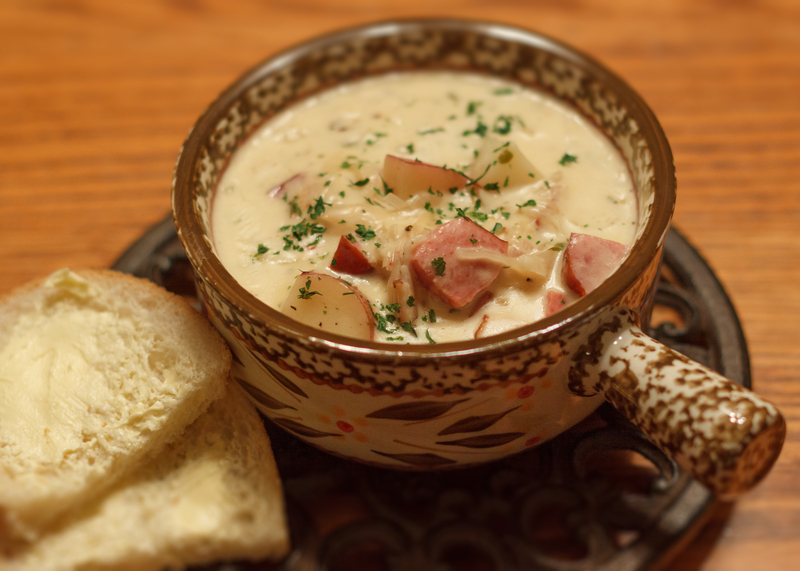 The bacon, Gouda cheese and kielbasa sausage add a wonderful, mellow depth of flavor that complements the briny bite of the kraut. The one thing I’ve found in my years of cooking is that people either love or detest sauerkraut — there is no middle ground. And for those that hate it, I say y’all are crazy. Do not add salt until you taste it first. Fry the bacon in a heavy skillet until most of the fat has rendered out, but do not let it get crispy. Remove and drain on paper towel. In a 3-quart heavy soup pot, add the butter and flour and cook over medium-low heat for 12-15 minutes to form a roux. Stir constantly with a spatula so it doesn’t scorch. Add the onion and cook until softened, about 5-7 minutes. Next, increase the heat to medium and add the cubed kielbasa. Saute for ten minutes. Add the heavy cream and chicken stock and bring to a low simmer. Add the rendered bacon and dry spices. Stir occasionally. Add the diced potatoes and the kraut. Cook for 1 hour, partially covered, over a very low simmer until the potatoes are tender. During the last 30 minutes, add the Gouda cheese and cook until melted and creamy, stirring often. Correct the seasoning and add salt if you need to, but keep in mind that the kraut, cheese and sausage are loaded with it. Serve in bread bowls or heavy crockware soup bowls with a dollop of sour cream and a nice spinach salad. 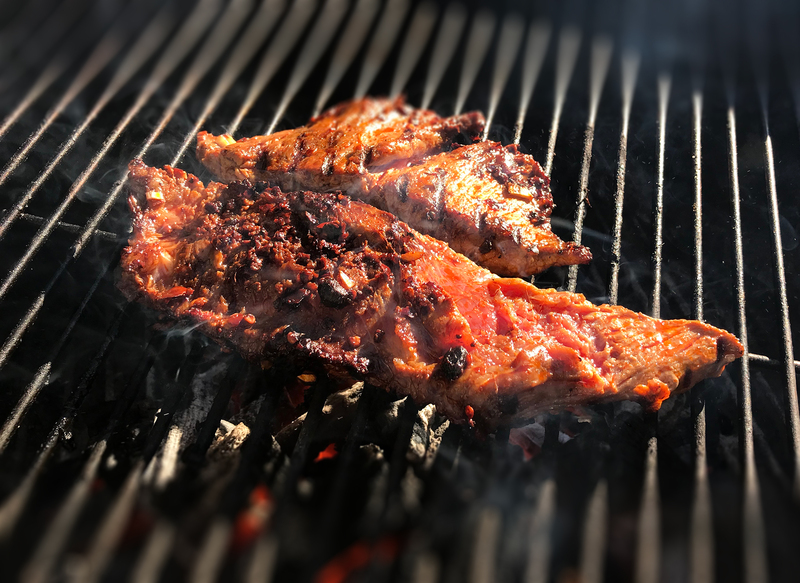 This is my original version of a Mexican classic, with a bit of southwest flair infused by New Mexican Hatch chili powder and mesquite wood smoke. As a shortcut, you can fry the chicken in a pan or just boil it before shredding, but why would you want to? Taking the extra time by preparing it on the grill adds an entirely new dimension to this satisfying dish. 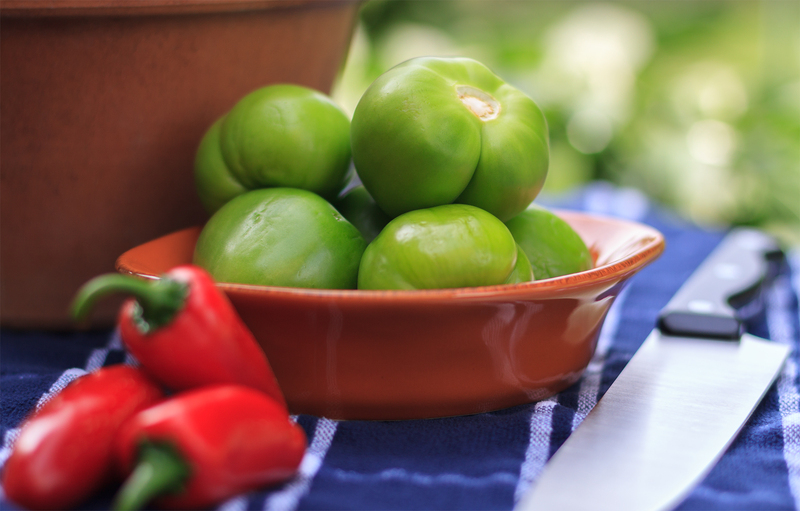 On a related note, blackening or charring the tomatoes, tomatillos and poblano pepper is essential for the depth of flavor needed — do not skip this step. I absolutely love this recipe! I hope you do too. The night before, prepare the chicken marinade so the flavor has time to set up. Pound the chicken breasts flat by using a spiked meat mallet. This will ensure that they cook evenly on the grill and allow the wood smoke to penetrate the meat. Place them in a ziplock storage bag. Whisk the marinade ingredients in a bowl and pour in with the chicken. Seal tightly and double bag it using another plastic storage bag to prevent leaks. Refrigerate for at least 12 hours. The next day, prepare an outdoor charcoal fire on a kettle grill. Use real lump charcoal, not briquettes. Prior to lighting the fire, soak a handful of mesquite chips in a bowl of water for about two hours. You only need a little as the flavor from the mesquite smoke is very intense. Place the soaked chips directly on the white-hot coals. 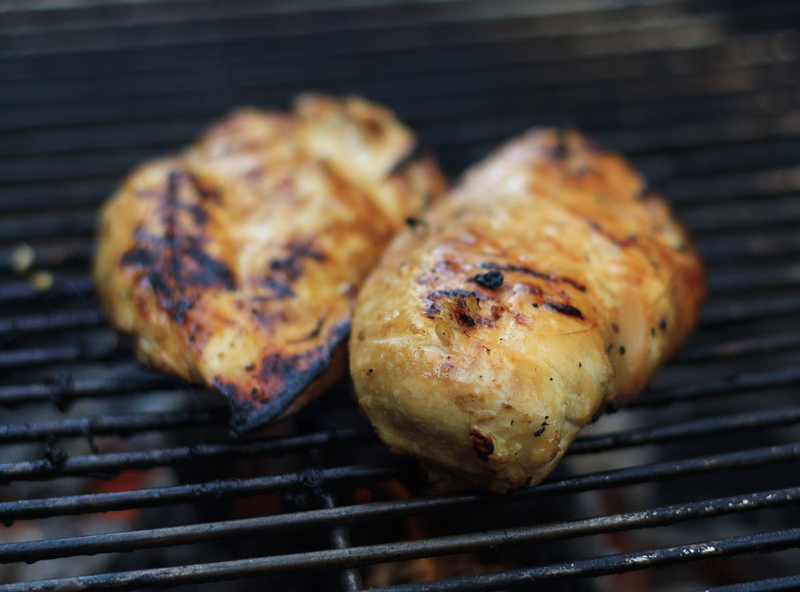 Grill the chicken over direct heat for about four minutes per side, ensuring that they have a nice crusty char on each side. Remove and let cool on a plate. You need not be concerned if they are a bit underdone. They will continue to cook in the pot in the next step. While the chicken is cooling, heat a 5-quart cast-iron Dutch oven over medium-low heat. Add the olive oil, onion and garlic. Saute for a few minutes until soft taking care not to scorch the garlic. Dice the charred tomatoes and tomatillos and add to the pot. Increase the heat to medium, and stir occasionally for another 5 minutes. Next, add the chicken broth, the New Mexican Hatch chili powder, chicken base, chipotle adobo sauce, Mexican oregano, salt and pepper. Increase the heat and bring to a slow boil. Simmer for 15 minutes, stirring occasionally. 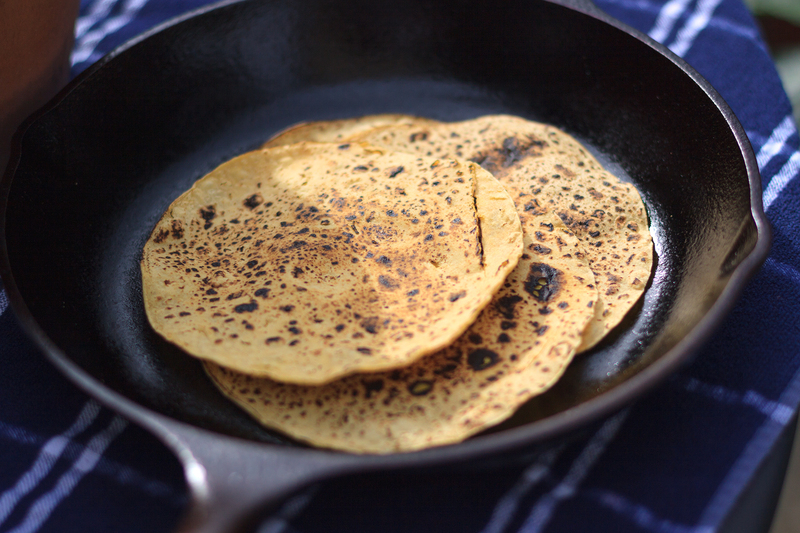 While the soup is simmering, cut up the charred tortillas and add them to the pot. Carefully transfer this mixture to a blender and pulse until smooth. Return the ingredients to the pot. 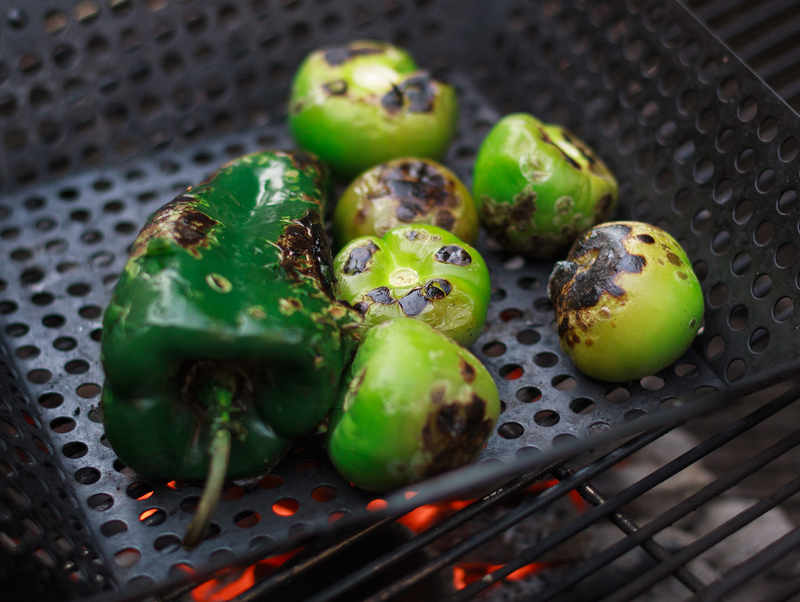 Prepare the poblano pepper by charring it with a propane torch or stovetop gas burner. Dice and add to the pot. Using two forks, shred the chicken and add to the pot. Drain the canned black beans and rinse in a colander with hot water. Simmer them in the soup for an additional 10 minutes. Serve with the garnish ingredients indicated. Leftovers freeze wonderfully. Note: Use extreme caution if using a propane torch indoors. I would highly recommend using a cast-iron pan on your stovetop as a makeshift heat-shield. 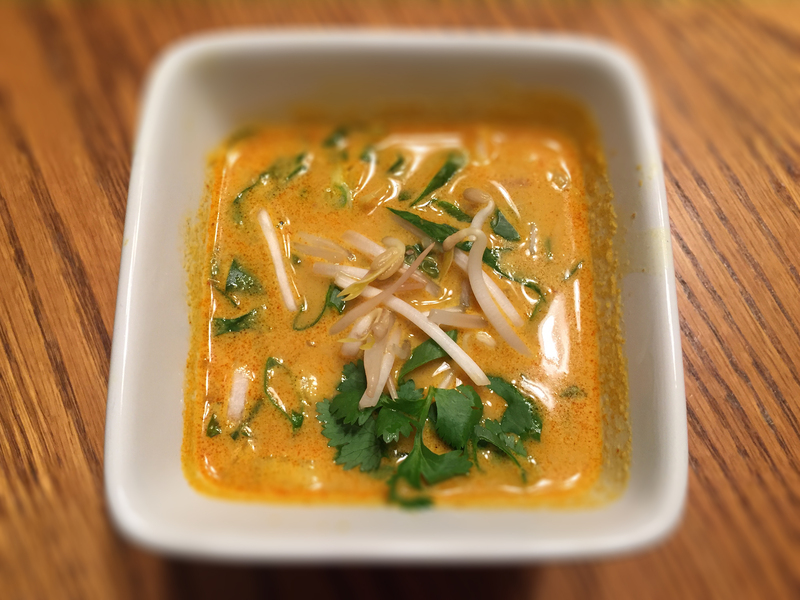 This is a wonderful recipe inspired by some of my favorite Thai cuisine. 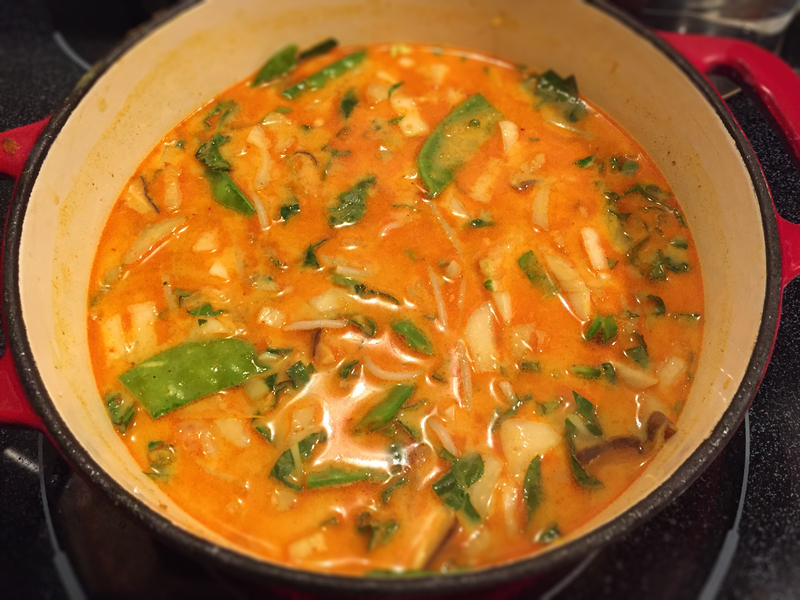 The red curry paste packs a sucker-punch, so use it sparingly until you know how spicy it is. The addition of turmeric will intensify the color of the dish. If you cannot find lemongrass, don’t worry. The paste already has it. 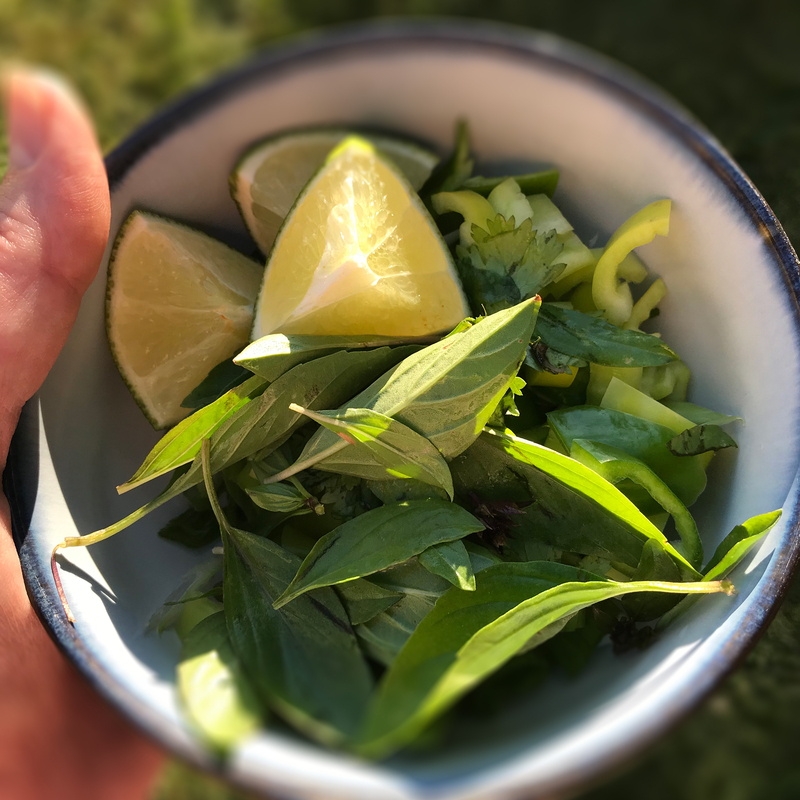 Adding fresh lemongrass will simply provide a more vibrant, complex flavor — remove it before serving as it is tough and will not break down. Note that the preparation is layered in stages so the tender vegetables go in at the end — this ensures that they don’t overcook. Enjoy, this is one of my all-time favorites. 1 stalk lemongrass; trim, peel and keep only 8″ of the tender base. Crush with a meat mallet and then cut in half. Cut, measure and prepare the ingredients prior to cooking so you have everything at hand. Thai cuisine is known for its short cooking time. Prepare the Asian vermicelli noodles according to package directions. Break them in half and cook until just al dente – about five minutes. Drain and reserve, covered. While you are preparing the noodles, place a 3.5-quart heavy soup pot over medium heat. Add the peanut oil and heat until shimmering. Add the shrimp and saute for two minutes until pink. Remove the shrimp and set aside. Add the red curry paste and minced shallot to the pot. Stir constantly until fragrant; about a minute. Watch closely so it doesn’t scorch. Add the sliced shitake mushrooms and the grated ginger. Continue stirring for two minutes. Next, add the chicken stock and increase the heat to a rolling boil. Add the turmeric, brown sugar and coconut milk. Add the lemongrass, kaffir lime leaves, jalapenos and the white part of the bok choy. Reserve the bok choy greens for later. Reduce heat to a low simmer. Add the lime juice, fish sauce, soy sauce and crushed birds-eye chili. Cook for seven to ten minutes, stirring occasionally. Add the basil, snap peas and bean sprouts at the very end. Add the prepared noodles, bok choy greens and shrimp to the pot. Stir and remove from heat. Remove and discard the lemongrass before serving. Garnish with red onion, scallion and cilantro. Drizzle with fresh lime juice if desired. 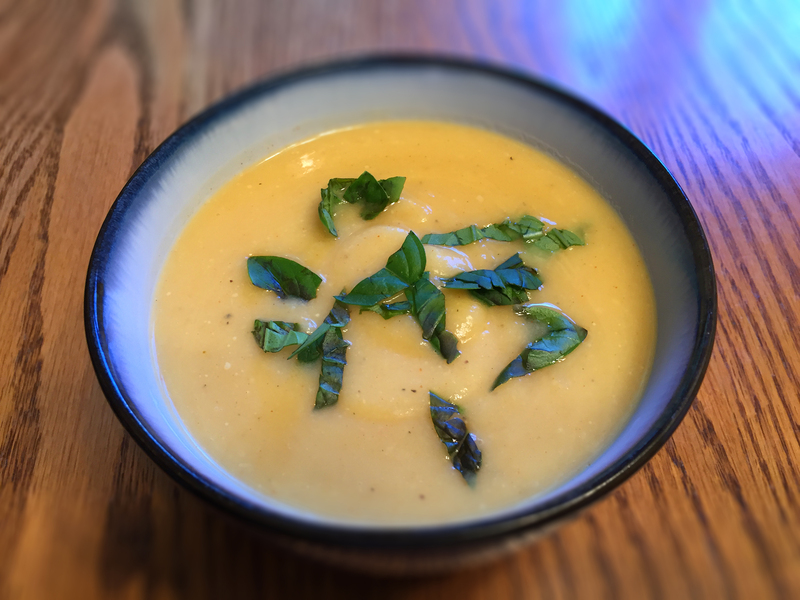 This is a savory, velvety-smooth soup that’s perfect for cold fall afternoons. 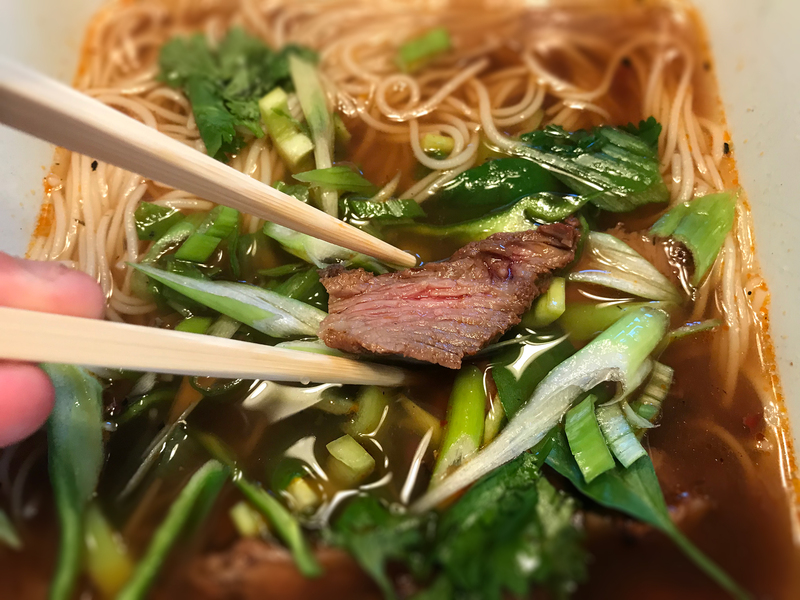 You can substitute thinly-sliced scallion greens for the basil. 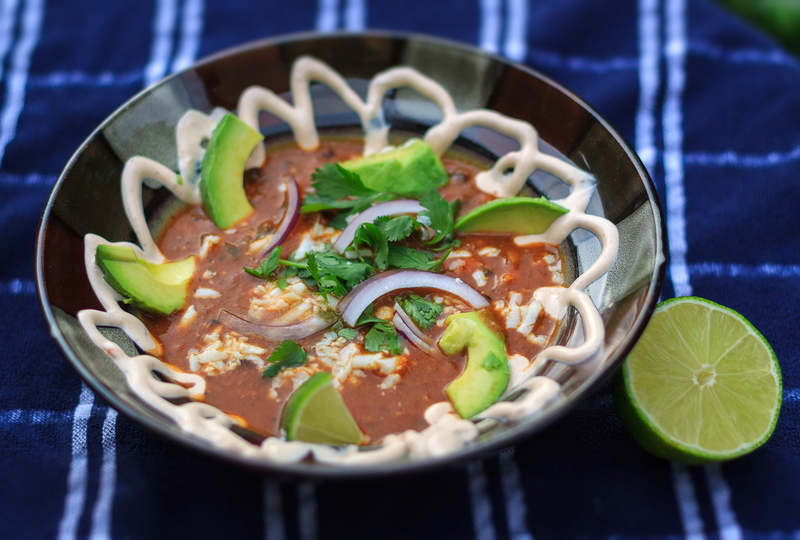 Sour cream adds a richer base of flavor, but you can also use one cup of heavy cream instead. Enjoy! Preheat oven to 375°-F. Using a very sharp 12” chef knife, carefully halve the acorn squash and core out the seeds and pulp with a spoon. Lop off the ends on each piece so they will sit level on a cookie sheet. Line a cookie sheet with aluminum foil, place the squash halves on the sheet and brush with olive oil. Bake for 50 minutes, or until the edges are golden brown. Remove and set aside for ten minutes to cool. While the squash is baking, heat a small, heavy cast-iron skillet over medium heat and add the garlic cloves. Leave the husks on. Turn occasionally and roast for about ten minutes until slightly charred. Remove, let cool and then peel. Spoon out the squash and transfer to a blender. Add the chicken stock, roasted garlic, sour cream, salted butter, smoked paprika, tarragon, salt and pepper. Pulse until smooth. Transfer to a heavy soup pot. Add the grated Parmesan cheese. Stir well and add the bay leaf. Cook over medium-low heat for about one hour, stirring often, so the flavors have time to incorporate. Serve with chopped fresh basil as a garnish. 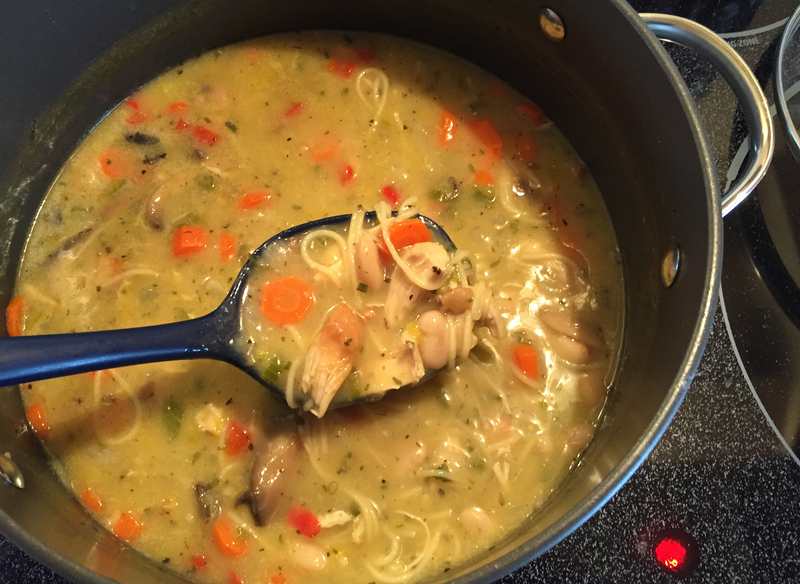 I threw this recipe together about fifteen years ago, as a way to use up leftover chicken meat. I’ve made it so often for the kids — who still rave about it as young adults — that I realized I’ve never recorded it here on Culinary Compost. Serve with a nice crusty bread and butter, and a tossed salad. Great for a Sunday lunch or dinner. Leftovers keep wonderfully. Enjoy! Using a large, heavy, 6-quart stock pot, add the diced carrots, onion, pepper and celery to 4 tbs. butter. Heat over medium until softened, about ten minutes, stirring occasionally with a wooden or silicone spatula. Add the olive oil and the flour. Reduce the heat slightly, and stir continuously for about five minutes to make a roux. Add the chicken stock. Cover the pot and allow to come to a boil, then reduce the heat to a very low simmer. Prepare the chicken meat by removing from the bone, then shredding into bite-sized pieces with a fork. Add to the pot. Add the dry spices and stir occasionally. Add the mushrooms (with the liquid from the can). Add the cream of chicken soup. Stir to incorporate and let simmer for at least a half hour, until the carrots and celery are just undercooked and still a bit crunchy. The volume should be reduced by a third. Add the beans (with the liquid from the can) and angel-hair pasta, and cook for an additional 15 minutes over very low heat until ready. At this point the vegetables will be perfectly done. Add water if necessary and go easy on the salt – the beans are loaded with it. Makes just over two quarts. 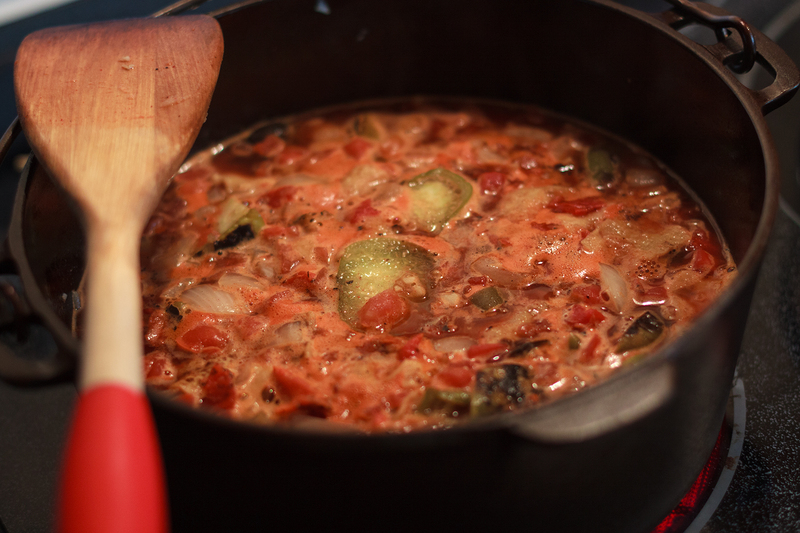 When preparing in a 3-quart soup pot, use 1-3/4 quarts water, and 8 tsp. chicken base. Do not add salt.